Happy Thanksgiving everyone! I’m done with my turkey lunch, had only a five minute drive to my sisters where the rest of my family came together and am starting on a nice and relaxing 11 days off of work. And I’m ready to do some writing and movie watching. But first off it’s time to talk about this week’s episode of S.H.I.E.L.D. where it tries to take a bit of a creepy tone with some ghosts and another almost tie-in with Thor. The episode takes a closer look at Melinda Mays’ backstory and adds a little to several of the other characters as well. But I didn’t think the attempt at bringing a thriller/horror element to the show worked very well and it had a very annoying character that they were trying to help. The character moments were great, but the rest was quite lacking. This week the agents are being a welcome wagon to a potential abnormal who seems to posess telekinetic abilities after an explosion at a particle accellerator that killed four of her co-workers. She is also a very religious person and feels like she is being punished by God, and she cries an awful lot. 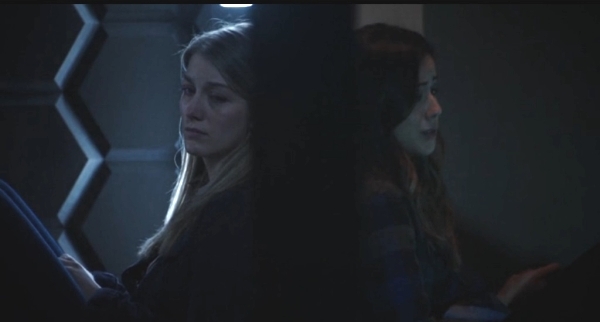 Skye spends most of the episode whining at Coulson to “Put me in, coach. I’m ready to play” which was annoying, but when she finally did get her chance, it worked out and added another nice little skillset to her cyber hacker personality. Melinda May had some of the best moments in the episode though, from the very beginning which was hinted at last episode where she invited Ward into her hotel room and it turns out that they are having a little tryst together while keeping it on the down low from their teammates. We also find out the story behind her Cavalry nickname along with a couple exaggerated versions of it. The best moments by far were the quieter moments, Skye and the crying girl, Coulson telling May’s backstory, and May talking with the “ghost”. The freak of the week story was a bit on the weak side. As I mentioned earlier, the woman who they initially think has telekinetic powers cries way too much and is just plain annoying. The effects on the guy who is stuck between two worlds looks great, but it’s annoying that he’s played as a brute and yet knows exactly what he needs to do to cut the power to the bus and how to take out the emergency antenna. 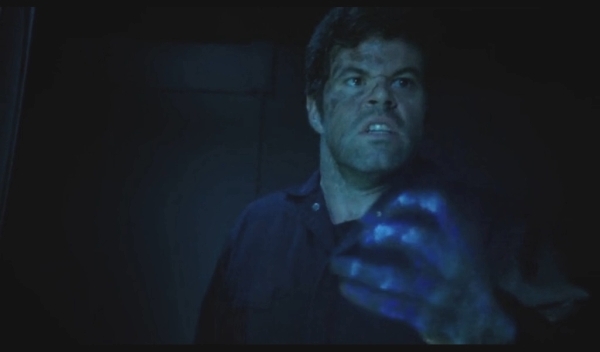 He may be a particle accelerator technician, but that doesn’t mean that he knows the exact schematics of the S.H.I.E.L.D. carrier when he’s popping in there seconds at a time. They also have the explanation that he’s supposedly coming back a little less every time, and yet what’s shown in the show is the exact opposite. There are a few neat scenes with the dark lighting and the flashing emergency lights, but it was mostly just typical cliched pseudo-horror moments that weren’t very effective. I also wanted to mention this week’s M.A.O.S. Declassified which is funny as usual, but also has a brief talk with some Marvel comics execs who talks about what’s coming up in the near future with the Thor comic line. Until next time, this has been Bubbawheat for Flights, Tights, and Movie Nights. Posted on November 28, 2013, in TV Nights and tagged Marvel, review, SHIELD, television, tv. Bookmark the permalink. 4 Comments. I’m still waiting for this show to take off. I’m enjoying the character moments when they come, but the weekly stories aren’t nearly as interesting. I’m thinking that adding a few more full-time cast members (or at least some recurring villains) would help a lot. You’re right, I think having their mysterious villainous group play a more tangible role would be a good thing for the show. We don’t have much to go on past the girl in the flower dress and she was only in one episode over a month ago. It’s doing well to build a solid foundation of good episodes, but hasn’t had anything to really make it take it to the next level yet, which I would like to see. That he knew how to shut down the plane didn’t bother me a whole lot… it was basically a question of “find the electrical and pull cords out”, which is pretty simple. Finding it might have been a bit of a challenge, but eh; he was working a high-tech maintenance job. He presumably wasn’t an idiot, at least not on the technical front. The constant angsting of both the “guest stars” was pretty irritating, though. It just seemed like it should have been more than just rip out a handful of cords to take down the entire plane. And yeah the woman had two modes: cry and religious angst.